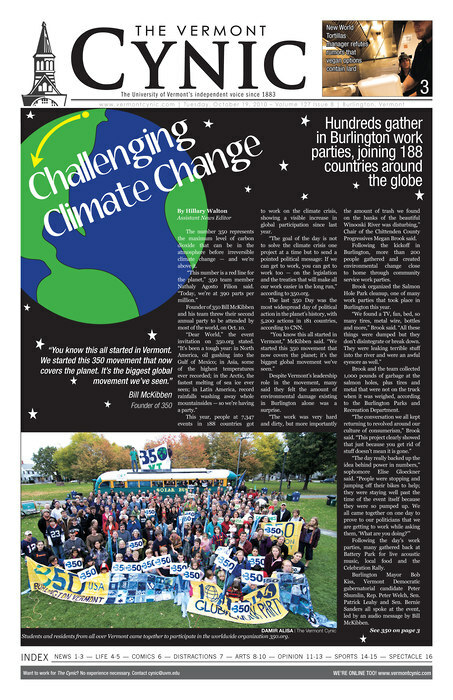 The University of Vermont’s student newspaper, The Vermont Cynic, has been named a finalist for the 2011 Pacemaker, widely considered the most prestigious award in college journalism. The Cynic’s placement on the list of finalists, announced this week, provided a boost for staff members in the Cynic’s newsroom, said Natalie DiBlasio, the newspaper’s editor-in-chief. “I am so excited!” DiBlasio wrote in an email. “With no journalism majors and an unpaid staff, being a finalist for this award is a direct representation of just how dedicated our staff is. The Newspaper Pacemaker contest, co-sponsored by the Newspaper Association of America Foundation and Associated Collegiate Press (ACP), has awarded general excellence in collegiate newspapers for 84 years, organizers state on the ACP website. This year’s entries were judged by professional journalists in the Washington, D.C., area. The GW Hatchet of George Washington University in Washington, D.C. Entries were judged based on criteria such as coverage and content, quality of writing and reporting, leadership on the opinion page, evidence of in-depth reporting, layout and design, and photography, art and graphics, the website states. Winners will be announced at the 90th Annual ACP/CMA National College Media Convention on Oct. 29 in Orlando.